Beoplay H8 is a good looking and great sounding headphone. The wireless on-ear headphone comes with a superior Bluetooth support. It has a wireless technology that matches up with time. There are no connectivity issues and the performance of the headphone is quite smooth. The best feature of the headphone is the active noise-canceling feature. It not only blocks the sound of the environment, it also provides you with great audio quality. Even if you switch off the noise-canceling feature, the headphone works great. Beoplay H8 headphone is indeed the best by Bang & Olufsen in the series of headphones introduced. Beoplay H8 is loaded with features for a great price it offers. It is quite a popular headphone if you compare it with other headphones that are available for this price. The headphone is beautifully designed and that makes it stand out from other headphones. The sturdy metal headband gives it an extra edge. It’s so stylish that you would love to carry it along with you wherever you go. Beoplay H8 headphone gives a high-end performance and it can be used for multifunctional needs. For an on-ear model, it is simply the best headphone you can think of. If you are a travel person, then this is certainly a great choice for you. Beoplay H8 has a noise-canceling feature and that blocks the noises from the environment. So, whether you are on a plane or on a train, you can hear your music loud and clear. It is also good if you want to completely switch off and transport into your world of music. You must buy this headphone for the amazing noise-canceling feature. In fact, most people buy this headphone for this amazing feature. The audio performance of the headphone is good so it will certainly entice the music lover in you. Beoplay H8 headphone is amazing in looks and that is what appeals to most people. If you are a big shipper of good looks, then this headphone is for you. Is this headphone good for your gaming needs? Well, you can use the headphone for all your gaming needs, as the sound of the headphone is crisp. But, most people prefer to buy the headphone for music and audio sound. The headphone is great in comfort and fit. You can also consider it if you need to wear it for a longer time duration. You can indeed consider this good-looking piece. There are many great features of Beoplay H8 headphone; let us look at some of the key features. Beoplay H8 headphone features Bang & Olufsen Signature Sound. It gives a temperate and open acoustic performance, designed to engulf you with its precision and amazing power. The headphone features active noise cancelation. You can absorb yourself in your music or simply enjoy the silence around. It also features a transparency mode that lets you adjust according to the ambiance sound. There is an Aluminum touch interface on the right ear cup of the headphone. It gives you total control of your music and phone calls that you make. Beoplay H8 headphone is not only super stylish in looks but its wireless connectivity is also awesome. The headphone features superior material and that gives it an extra edge over other headphones that are available in its class. It features a streamlined on-ear wearing style. It is different from other headphones that are available in this range. The streamlined design comes with superb ergonomics. The headphone is completely light in weight so you will not feel any kind of pressure on your ears. Beoplay H8 headphone gives you optimal comfort and a great fit. The headphone comes with new features that include transparency mode so you can perfectly tune into ambient sounds. The proximity sensors for automatic play/pause buttons give you easy access while listening to your favorite playlist. The headphone features two dedicated microphones that are placed at an optimal angel so that the sound is clear. The battery life of the Beoplay H8 is also good. Up to 14 hours of battery life with active noise cancellation feature and Bluetooth functionally is quite good. You do not have to worry about continuous charging. You can charge it once and enjoy music on the go. The overall battery performance of the headphone is also good. At just 255g, BeoPlay H8 is one of the lightest wireless active noise canceling headphones available in this range. This makes the headphone popular and well liked. The battery can be replaced and recharged. It is available with a USB charging cable of 4.2″. Comfort wise, the headphone is good. Actually, there is too much focus on its stylish looks and this affects the comfort somewhere. The headphone has a sturdy metal body so it can bother you at times. But, it is also light in weight being a wireless on-ear headphone. The fit is also great and it won’t really bother you if you wear it for a longer time duration. The ear cups are comfortable and there is no issue on that front. You might feel some pressure if you wear it for too long. The memory foam ear pads provide a great fit though. Beoplay H8 headphone has active noise cancellation feature. This makes it the most popular headphone in its league. The feature not only blocks the ambient sound but also gives you a great audio quality. The noise-canceling feature is also handy if you want to spend some time alone. Expect complete silence with this feature. The best part about this feature is its functionality. It features two different microphones so you can easily turn the sound on. If you don’t want to use this feature, you can turn it off. The option is flexible and you can use it accordingly. In the design department, this scores big time. The looks of the headphone are so stylish that you would love to flaunt it everywhere. Rarely an on-ear headphone is so stylish in design. There is a leather finish cushion on the ear cup and that provides with complete comfort. The headphone is made from premium quality fabric and that makes it more durable. In fact, even if you use the headphone for rough use, there won’t be an issue as such. The build is sturdy but it’s still light in weight. The style feature is great being an on-ear headphone. The bass base of the headphone is deep and that is the best part about the headphone. It has a warm tone audio and that is again great for low-frequency sounds or music. The midrange clarity of the headphone is good as compared to other headphones that are available at this price. Being wireless also, this headphone has an amazing sound quality. There is no issue of connectivity with the headphone and you can easily hear different types of music without any problem. The high range of the headphone is average and not that great. The battery life of Beoplay H8 headphone is good. You can also expect a long battery life with Bluetooth functionality and noise cancellation feature. Once you charge the battery, you do not need to worry about recharge every time. The charging of the headphone is quick so it also saves your time. The battery is also replaceable and removable. If there is an issue with the battery, you can fix it by removing the battery. The overall battery of the headphone is good with the price it offers. The headphone has a premium leather finish. It has soft cushion ear cups. The wireless option is good. It has a balanced level of the bass base. It’s expensive for its features. It is quite big in the build. 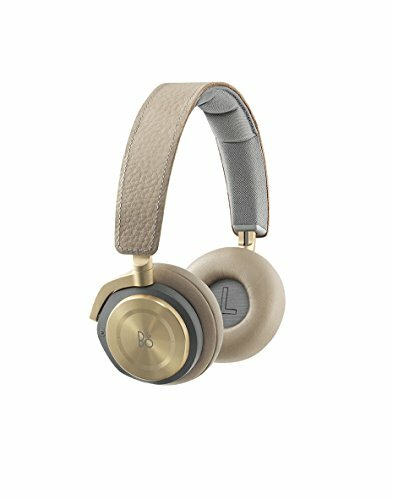 If a brand is what you look for while buying a good headphone, then you can consider Beoplay H8 headphone. The overall functionality and performance of the headphone are good. The high-quality sound with a balanced treble and bass makes the sound clear. The only issue with the headphone is its comfort. The headphone is light in weight being wireless but it can bother you if you wear it for a longer time duration. The battery performance of the headphone is great. A battery performance of more than 10 hours can enhance your music experience. Bluetooth connectivity of the headphone is average and it suffers in this feature. However, this does not affect the connectivity of the headphone. The leather cushioning of the headphone is also good. The headphone is too stylish in looks and it gives you value for money too. Price wise, this headphone is on the expensive side. But, it’s worth the money.